Came across this sign some time ago and immediately it jumped out at me, so I saved it. As I began to pray this particular morning during my devotional time with the Lord, God brought this back to my remembrance. Had been asking Him for a Word for the year that will anchor me. We need a Word from the Lord to hold on to. A Word that will give us hope and strengthen us for the trials and even the triumphs to come. That’s the purpose of a New Year theme in church that Pastors often share during the Watch Night services or the first message of the New Year. The Word that the Pastor delivers at this time is usually an anchor to the congregation, giving them something to stand on, a Word to remember, to hold on to, when things start to go a little awry (and they will). Last year, the Word God had for us as a church was “Come Out Fightin'” (Though a year has passed, I encourage you to take a listen, the Word is always appropriate in our walk with Christ). And yes, a strange word, but it seems that was all we had to do all year as the enemy found different ways to oppose us. Each battle and each struggle that I personally faced last year, that Word popped up in my spirit, (and of others) as things came to challenge my faith. 'We wrestle not against flesh and blood, but of principalities...' It brought me back to where I should be, standing on the Word of God and contending for my faith. Fight the good fight of faith, that's what the Word says. And while things happened, I yet remained victorious at the end of the year. What was meant to destroy me, what was meant to kill me, did not. It is 2018 and I am still here. I am still alive. I am reminded of the words of my dear son Joseph who shared so poetically in one of his spoken word performances, (oh, how I miss them) … “See, they say, the human heart beats 4,000 times per hour. Each beat, each pulse, each rhythm, each drop, is a token, is a trophy, is a reward, engraved with these words, you are still alive.” I am still alive. Albeit, broken. Anyway, as I had been asking God for a Word, He spoke to me New Year’s Day and said, “Restoration and Renewal.” And while I thought that this would be my anchor for the year, and it some ways it yet is, God spoke again. I’ve learned that God often speaks in sentences, a thought today, a Word tomorrow, that if we would only string it together, we would have our ‘Morse code’ from God, a battle plan for our victory. So, this particular morning, God continued to speak and spoke to me through this image... about brokenness. You see when my Joseph was killed, something broke in me. My heart. Joseph is my only son. He was my last born. He was just 22. Just getting started. And we won’t ever be able to see him continue. In his career, in his performances. In his life. He won't ever marry or have his own family. Life was stripped from him. And life was stripped from me. I birthed three children and now that was broken, for now I only had two. And when he died, so did my passion, my ability to focus, my desire to live as I had been. My faith was shaken. Betrayal came, and I lost friends and people I thought loved me. And so much more, that is not for me to share at this moment. But I was broken. And God spoke to me and said, “Broken crayons still color.” And regarding the restoration and renewal, in order to be renewed, you must first be broken. But understand, in that brokenness, God yet desires to work in you and through you. He yet desires to use you. He yet desires to use me. Broken crayons still color. This is what He said. Think about a crayon. They are used to bring a black and white drawing to life. To add color to a sketching. When we were young, we had all kinds of coloring books. The color by number. The magic coloring books where things would appear once you colored them. Theme coloring books, animals, toys, so many. And we had all sorts of boxes of crayons; the 8, 16, 24, and the double-sized box of 64 with the sharpener. And those of us who came later even had the erasable crayons. And we loved to color with a brand-new box of crayons. We couldn’t wait to use those. It was just something about them. They had a point so that we could make our coloring more accurate, staying in the lines. But there was always somebody who colored outside of the lines (and that’s a whole other message, but sometimes we need to color outside of the lines and not do what everybody else is doing), but anyway, for the most part we needed to stay in the lines in order to have a pretty and perfect view, and color of whatever the subject was. (Order is needed as well, but that too is another message). As a child, sometimes I would color and color with the same crayon, usually the black one, that seemed to be used the most. (Or the blue and green, as there was always a sky or grass in the drawing that needed to be colored). But those particular crayons would be used so much, they often broke. And that was it. Once those crayons were broken, it was like the whole pack did not work. And most times it would stop me from coloring at all, because I could not use that one color. I was like that as a kid (still like that in some ways). Everything had to work. Everything had to match. My hair had to be neat or I would cry. "The crayon is broken!" I would yell to whoever was around. And I would stop coloring or declare the whole box of crayons, worthless. (Thank God that when something breaks within us, He doesn’t toss us out, or stop using us, declaring us worthless). Anyway, when we really wanted to color, especially if there was nothing else for us to do (there were no video games, or Netflix, or cellphones), sometimes we would take that broken crayon and peel off the paper, sharpen it and use it anyway. As broken as it was. But what made it even better was since the crayon was broken, we could share it and someone else could actually use that broken piece. 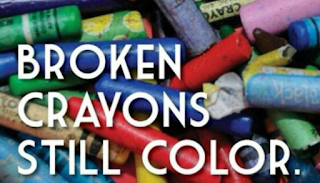 Broken crayons still color. And they still can be used to make a difference. When we find ourselves broken, just like we did with our broken crayons, God just peels away that layer of paper, that thing that holds us back from being used, and He sharpens us and puts us back to work. Back in the box with all the rest of the crayons. Back in the midst of life with all of the rest of the people. And the piece that was broken, broken off of us, He allows us to share with someone else, so that they can color too. Our shared experiences serve as a threshold for someone else to share their experiences. That broken piece of us, where our heart was broken because of betrayal or rejection or loneliness or even death, God allows someone else to learn from and now they are able to color with it. To use the experience, they gained and the wisdom they learned from your broken piece and color with it. Make the world around them, and the people they meet better. God will use our brokenness in spite of our brokenness. And each time we break, He will sharpen us and make us new so that we can still color. So that we can still make a difference. Just because we are broken, just because things happen to us, death, sickness, a fall from grace even, does not mean God cannot use that situation, or use us as we go through it. And every time I am reminded of just how broken I am, God reminds me “yep, but you're still coloring.” So, with God’s help and by His grace, I’ll just take my broken self and continue to color all the plans, God draws for me. Or puts in the Book. Though broken, I shall not die, but live to declare the glory of the Lord. For there SHALL be glory after this. And I am still, a servant of the Lord, coloring.